Yesterday, the SB Nation-NBA network collectively said farewell to long-time NBA commissioner David Stern. For women’s basketball fans, Stern’s legacy is as significant as it is to any NBA team. It should be obvious to most women’s basketball fans that we owe a debt of gratitude to David Stern one of the most significant figures in the development of women’s basketball in the U.S.
Perhaps fans of the now-defunct ABL will object to that notion, but – as Mechelle Voepel has already described – the pragmatic view is that the NBA’s infrastructure may simply have been better-suited to support a women’s basketball league in a society that had not responded well to previous iterations of women’s professional sports. There have been a number of great articles around the web about his legacy – including some interesting takes from around the SB Nation-NBA network – but one of the best, or at the very least most comprehensive reads, was David Aldridge’s oral history of Stern’s life and legacy published this past Monday. There are a number of great insights from those involved with both the formation of the WNBA and the decision to put together a team of women’s basketball pros after the success of the men’s “Dream Team” in the 1992 Summer Olympics, including a number of quotes from Val Ackerman regarding her journey from Wall Street to becoming the first WNBA President. The section about the WNBA in particular is certainly interesting, but one of the recurring themes from the oral history might have been best articulated by General Ronald Johnson, brought in by Stern as a supervisor of referees. NBA legend Bill Russell, among others, has made the point that Stern was the one responsible for making the NBA a true “major league”. As described at length in the oral history, that demanding leadership style is a large part of what helped the NBA along that path from cleaning up the league’s image to finding corporate sponsors to finding broadcast partners. 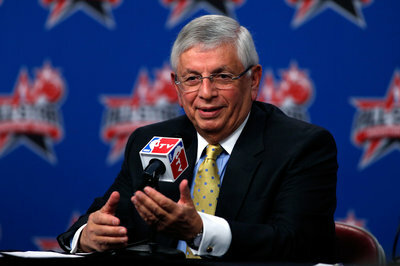 Without Stern’s dogged determination in building the brand of U.S. pro basketball, the WNBA wouldn’t have had that infrastructure to stand on in its early days – that’s not even to mention Stern’s application of his “demanding, but not unreasonable” leadership style to bear on his role as women’s professional basketball champion. We can’t fully exclude the possibility that women’s pro basketball would have succeeded if the ABL hadn’t received a challenge from a NBA-backed competitor, but to Ackerman’s point at the end of the WNBA section of Aldridge’s history we also can’t deny his significance to women’s basketball or women’s sports more generally. Aldridge’s summary near the end of his oral history states that, “…you could measure his time by the seismic social change that has occurred in his league.” It’s not accurate to say that the WNBA has had a seismic impact on pop culture in the way the NBA has, but if the women’s league does eventually make the leaps that the men’s league does Stern will certainly deserve ample credit. For more on David Stern’s legacy from around the NBA, check out SBN’s David Stern Farewell Day section.